Put them on your mirror and recite them each morning. Put them on your workout machines to memorize while you exercise. Put them above the kitchen sink and meditate on them while doing the dishes. Put them on your dashboard and delight in them during traffic. Put them inside your spouse's briefcase for a reminder of the Word at work. Put them on a vase when giving flowers to cheer someone up. Put them on a brown bag lunch you share with someone in need. Put them on public bulletin boards in your community. 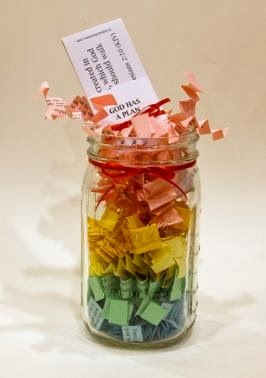 So if you are looking for a creative gift idea then go check the site out and pick up your Scripture Stickies. This can really help your kids, spouses, or whom ever keep the word of God on their hearts each and every day!